Herdez Carnitas and Charro Beans - Cocina Mexicana - Authentic carnitas with a side of pinto beans. 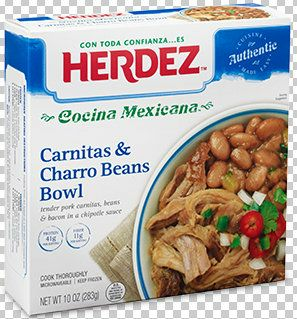 Tender pork carnitas, beans and bacon in a chipotle sauce by Herdez new line of Cocina Mexicana Bowls. All of the best savory flavors of Mexico. Two time-honored Mexican dishes come together in this savory and satisfying bowl. Experience tender, shredded pork marinated in orange juice and seasonings and then slow-cooked to perfection�with a side of Charro beans that includes pinto beans cooked in bacon, green chiles and fiery chipotle.